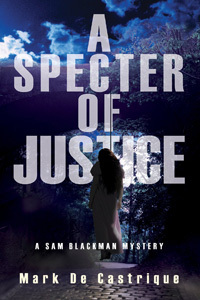 A Specter of Justice by Mark de Castrique: Synopsis and Online Purchase Options. Synopsis (from the publisher): When private detective Sam Blackman agrees to help his partner and lover, Nakayla Robertson, conduct a fundraiser for orphaned twin boys, he does so to ease his conscience. The boys' parents were killed in a courtroom shootout where Sam was the key witness against the twins' father. The charity event, a nighttime ghost tour of the legendary haunted sites of Asheville, North Carolina, seems harmless enough. Sam only has to tell the story of a grief-stricken woman who hanged herself from an old, arched stone bridge. “Helen, come forth,” he cries. Sam and his tour-goers expect the actress playing Helen's ghost to walk toward them from the bridge's dark recesses. Instead, her body tumbles from overhead and dangles at the end of a noose. Someone has reenacted the legend with deadly authenticity. When a second murder mimics another old ghost tale, the police fear a macabre serial killer is on the prowl. But the case isn't Sam's to solve. Then, a tidal wave of evidence begins to point to one man -- Sam's friend, defense attorney Hewitt Donaldson. Sam and Nakayla, firmly believing in Donaldson's innocence, must not only prove it, but halt a murderer seemingly bent on retribution. Does the killer's motivation rise from the present, or is Team Donaldson dealing with some specter from the past?